Temperature: A is best, C is "acceptable", and it represents a tire's resistance to heat generated by friction between the tire and roadway. 275 is the section width (in millimeters) from one sidewall to the other at the tire's widest point (the bulge) when mounted on a specifically sized rim and inflated to the recommended pressure. The section width varies approximately 0.2" for every 0.5" change in rim width. 60 is the "aspect ratio" and determines the sidewall height. On this example, the sidewall height is 60% of the section width (275 mm) and is 165 mm, again, based on the proper rim width and inflation pressure. 15 is the rim diameter in inches. 107 The 107 represents the tire's load rating. As the number goes up, the load rating of the tire goes up. Each number (i.e. 107, or 93, or whatever) represents a certain weight that particular tire can handle in proper conditions. Q capable of speeds up to 100 mph. R capable of speeds up to 106 mph. S capable of speeds up to 112 mph. T capable of speeds up to 118 mph. U capable of speeds up to 124 mph. H capable of speeds up to 130 mph. V capable of speeds up to 149 mph. W capable of speeds up to 168 mph. Y capable of speeds up to 186 mph. Z capable of speeds above 149 mph. The way to figure out the width and height in inches from your P-metric tire designation is as follows: Take the section width, in this case 275 mm, and divide by 25.4 because there are 25.4 millimeters in an inch. Multiply that by the aspect ratio, in this case 60%, or .60. That will give you the height of one sidewall in inches. Multiply by two because you have two sidewalls from the ground to the top of the tire, and add the rim diameter. Presto. Piece of cake! An example: The diameter of a P275/60HR15 tire is: 275mm / 25.4 x .60 x 2 + 15 = 27.99" diameter. For specific tire diameters based on the p-metric designation, scroll down or click here. 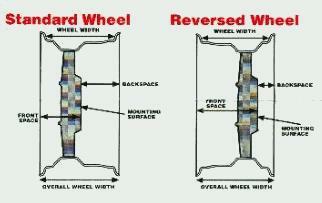 Backspacing is the distance from a wheel�s mounting surface to the farthest point inboard on the wheel. Make sure to measure from the exact point where the wheel will contact the car, not from any depression that may be between the lug nuts. Deeper backspacing moves the wheel and tire towards the center of the car; shallower moves them outward away from the center of the car. For very clear information about backspacing, frontspacing, bolt circle, and general wheel clearance go to the Wheel Vintiques' Website. Simply find the wheel diameter in which you're interested, then cross the section width with the aspect ratio and you'll get the diameter in inches. Nuttin' to it.